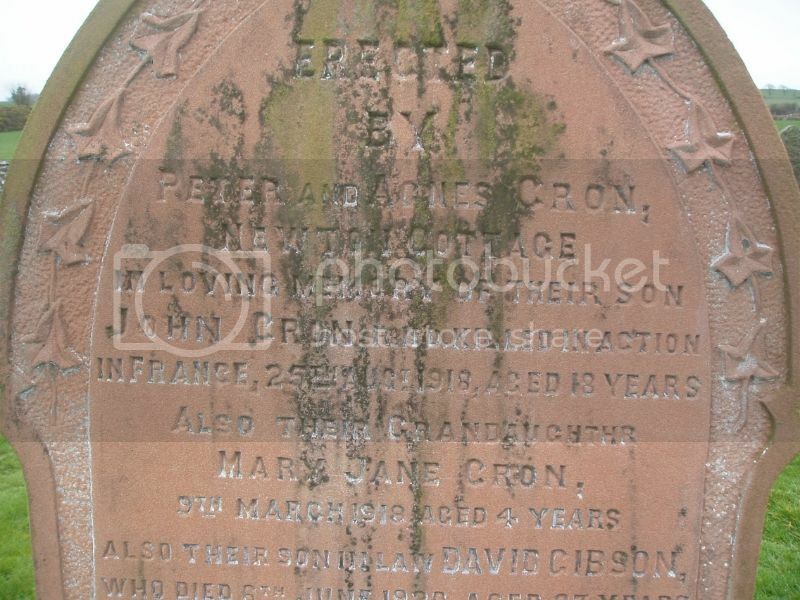 Additional information: Son of Peter and Agnes Cron, of Newton Cottage, Kirkinner, Wigtownshire. 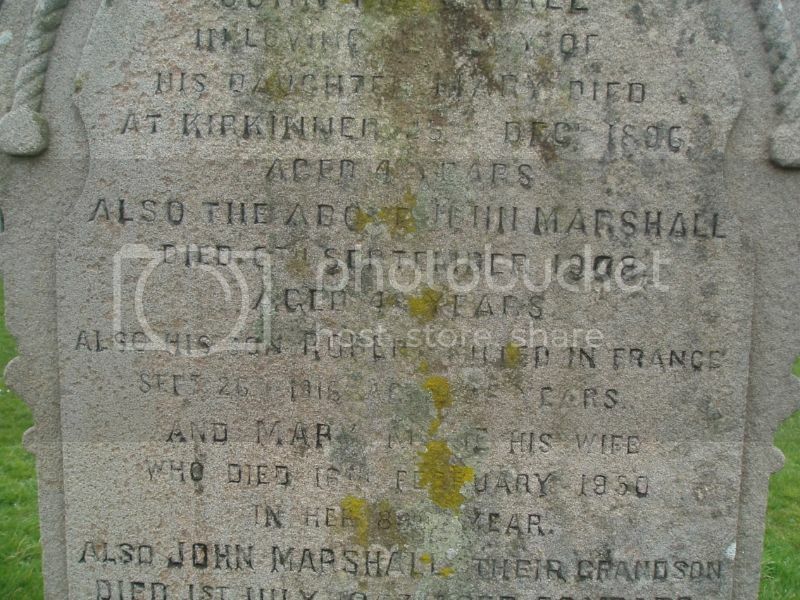 Additional information: Son of William and A. W. Garrett, of Kirkinner, Wigtownshire. 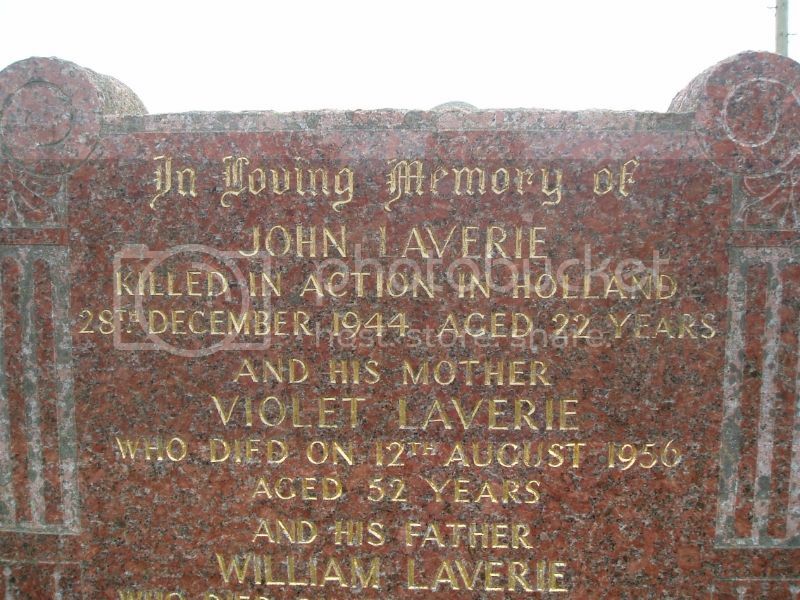 Wigtownshire Free Press (21 September 1916) reported: Mr and Mrs Garrett, North Balfern, Kirkinner, have received official intimation that their son, Lance Corporal Wm Garrett, HLI, was killed on September 25th 1915, in France. Before enlistment he was employed by Mr Sproat, North Balfern, and was much respected by all who knew him, as he was of a kindly and cheery nature. Lance Corporal Garrett was only 21 years of age when he met his death in action. 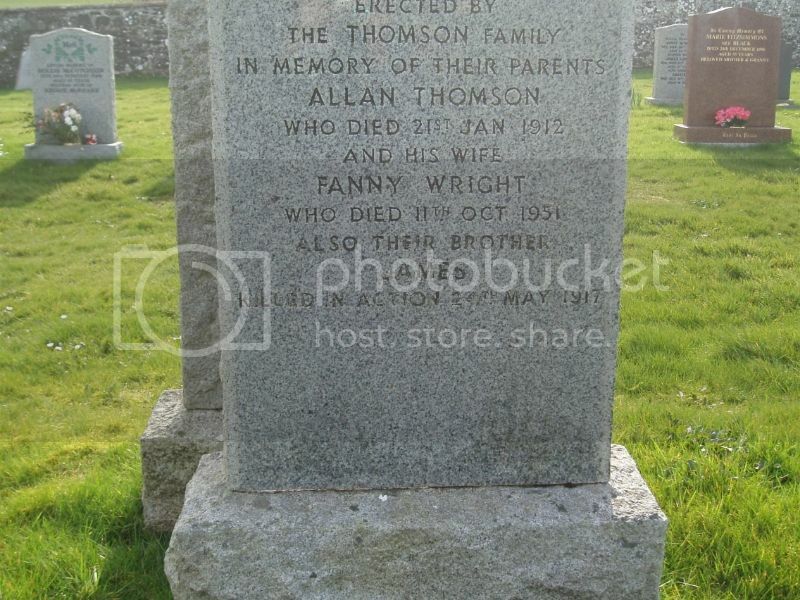 Additional information: Son of Thomas and Elizabeth Harrison, of Station View, Whauphill, Wigtownshire. 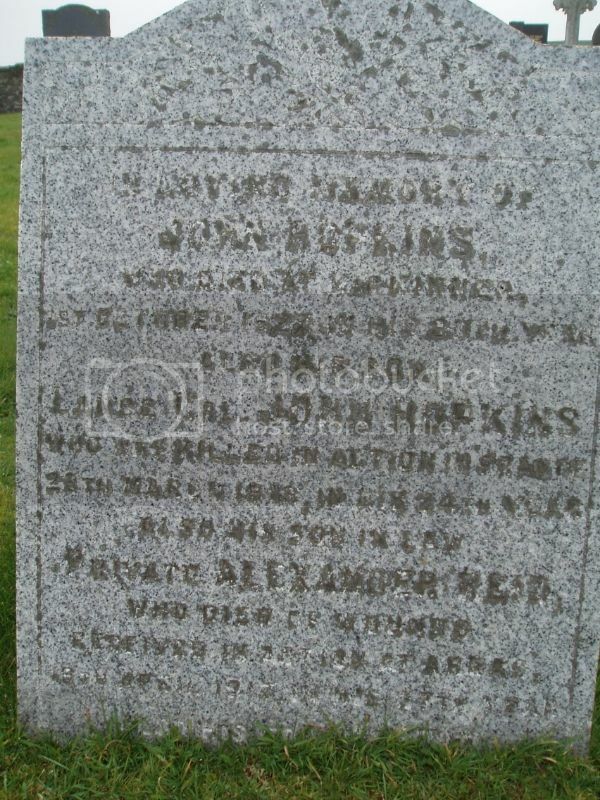 Wigtownshire Free Press (25 April 1918) reported: Killed in action on 29th March, Lance-Corpl John Hopkins, HLI, youngest and dearly beloved son of Mr and Mrs Hopkins, Kirkinner, aged 24 years. Wigtownshire Free Press (3 May 1917) reported: Died of wounds on the 19th ult at 42nd Casualty Clearing Station, Private Alexander Reid, Canadian Contingent, beloved husband of Christina Hopkins, Kirkinner, aged 25 years. 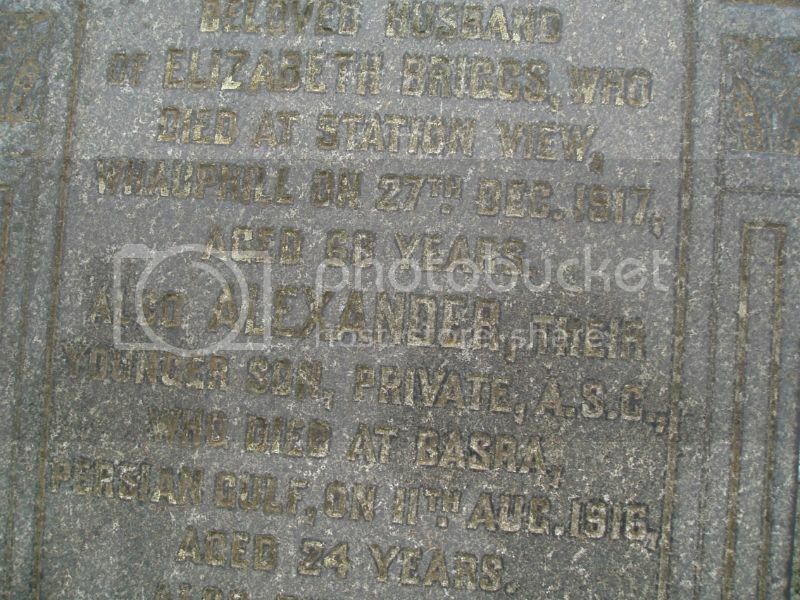 Regiment/Service: Royal Field Artillery, 99th Bde Ammunition Col.
Additional information: Son of George and Helen Leabody, of Claycrop, Kirkinner, Wigtownshire. 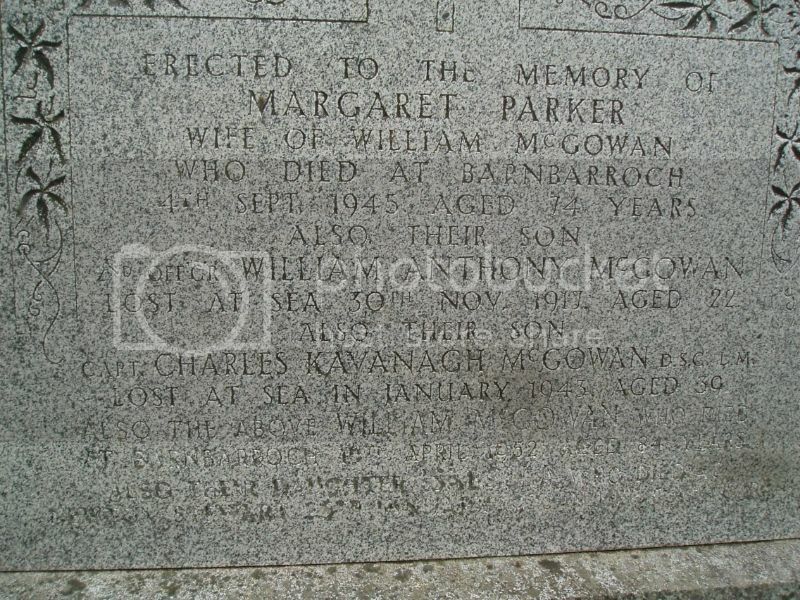 Additional information: Son of William McGowan. Born at Newton Stewart. On November 30th 1917, SS Kalibia, on a voyage from Norfolk to Bordeaux with a cargo of steel billets, was sunk by German submarine U-80, 29 miles southwest of The Lizard. 25 persons were lost. 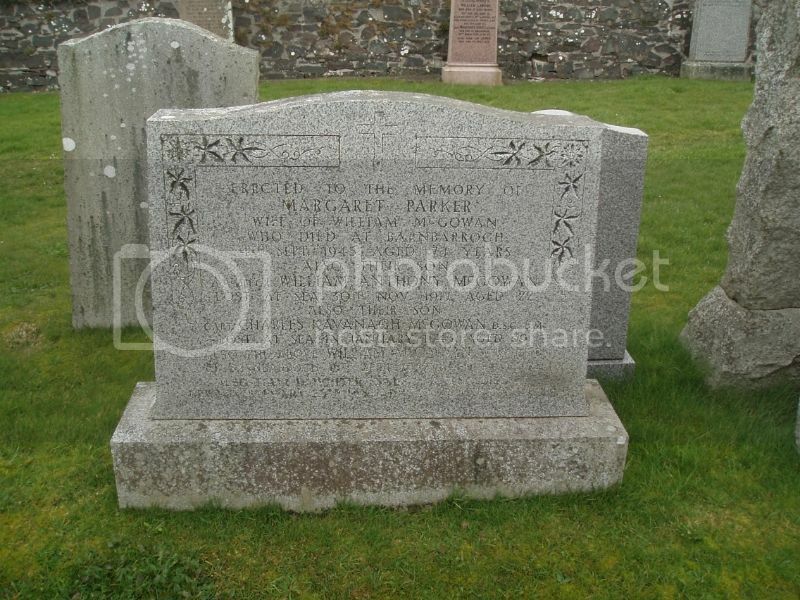 Additional information: Husband of Isabella McGowan, of Bishopton, Renfrewshire. Requisitioned by the Admiralty on Tuesday 29 August 1939, the St Sunniva took part in the Norwegian Campaign and took up duties at Scapa Flow as a guardship from October 1939 until September 1942, with occasional trips to Aberdeen. In Sept 1942 the vessel was converted at Hull to a convoy rescue ship, departing from the Clyde on 2 Jan. 1943. 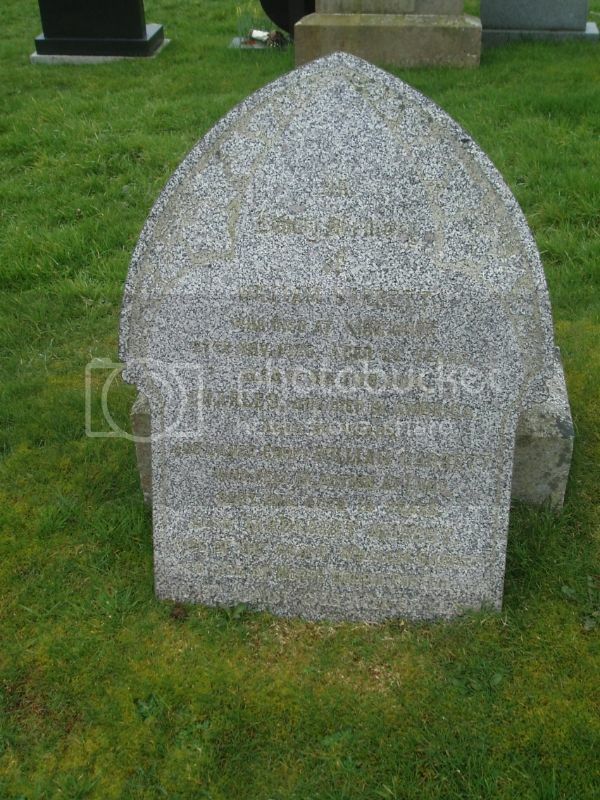 Between 21st and 22nd January 1943 she disappeared without trace whilst serving as rescue ship with transatlantic convoy (it is presumed that her masts and rigging became encrusted with ice and she turned turtle). She was lost with all hands. 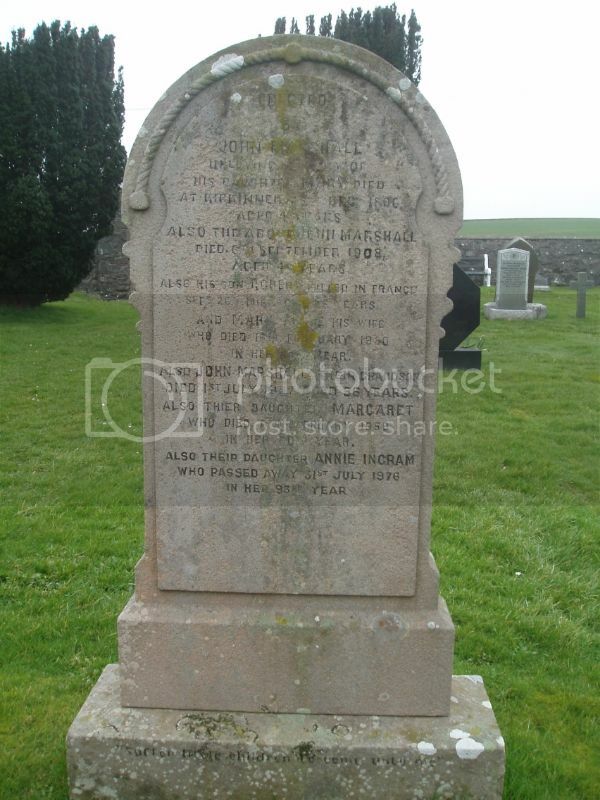 Captain Charles Kavanagh McGowan, Master. 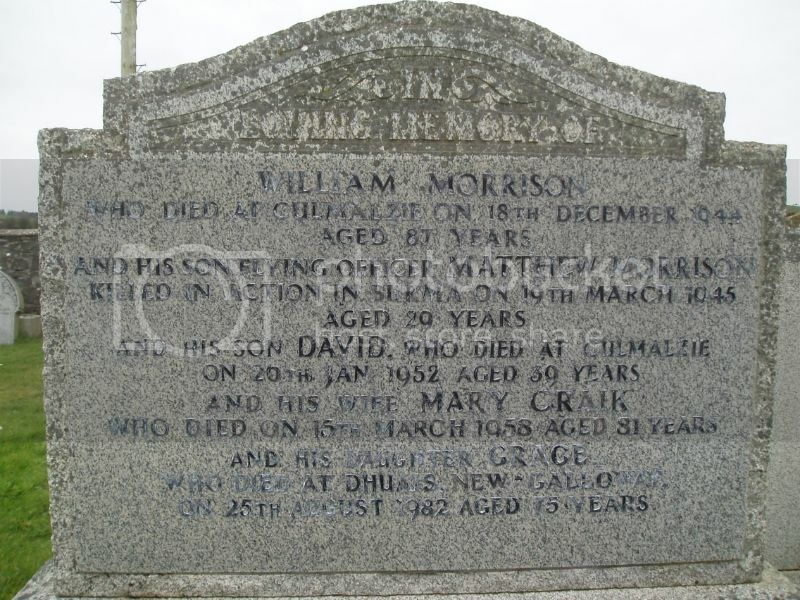 Additional information: Son of William Morrison, and of Mary Morrison (nee Craik). 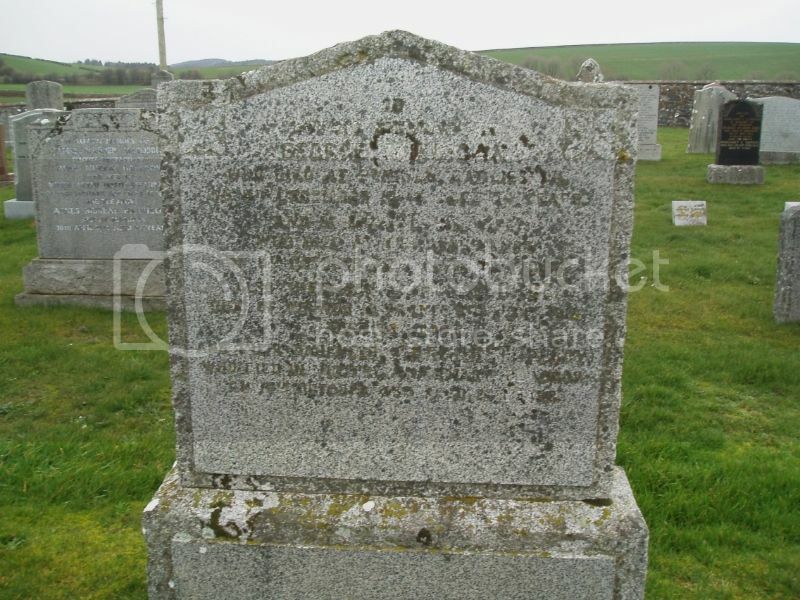 Additional Information: Son of George and Grace Milligan, of Claunch, Sorbie, Wigtownshire. 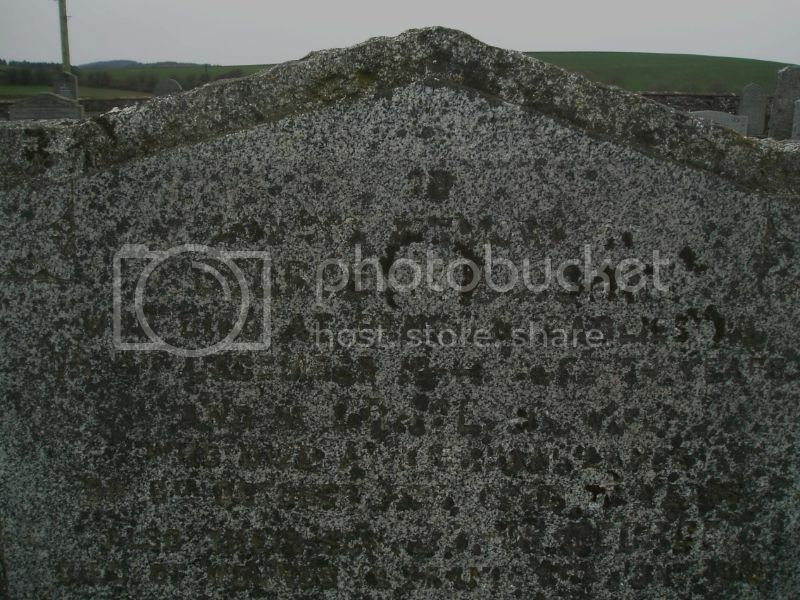 Born at Culbae, Kirkinner, Wigtownshire. 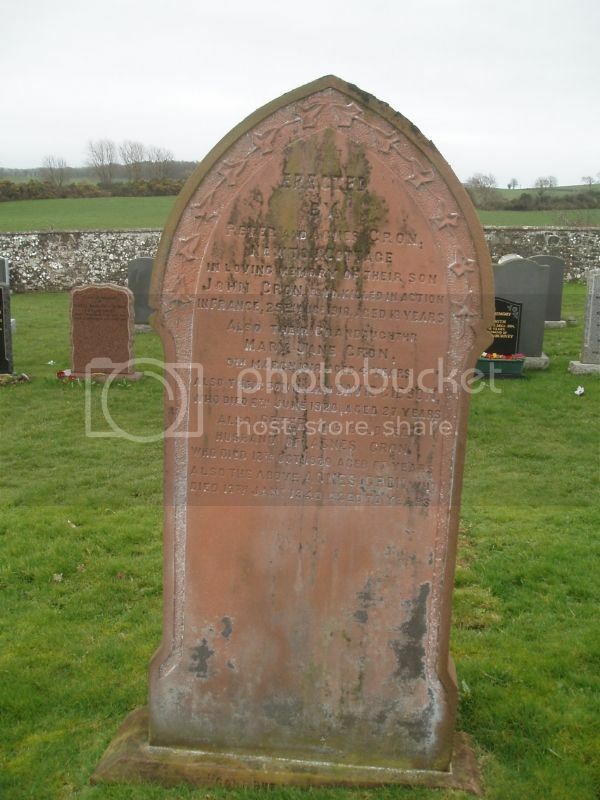 The headstone is virtually unreadable but a survey 35 years ago was able to identify: In loving memory of George Milligan who died at Penkiln, Garlieston, on 4th December 1944 aged 74 years. 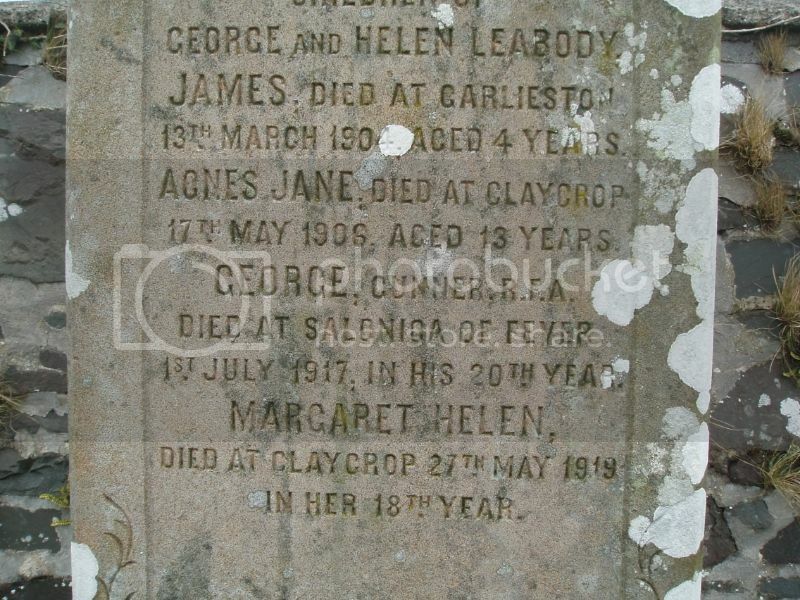 And of Grace his wife who died at Kirkham, Lancs, on 8th October 1938 aged 70 years. 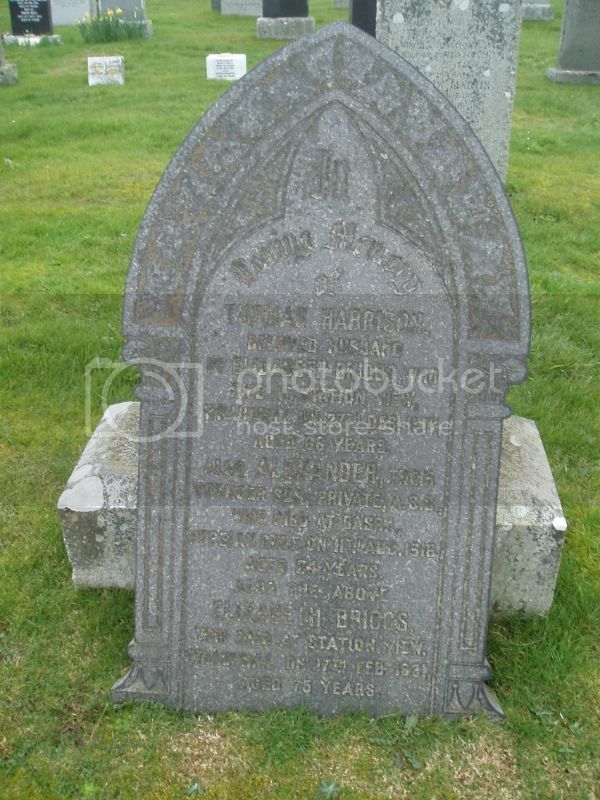 Also their son George died of wounds in France 11th June 1918 aged 26 years. 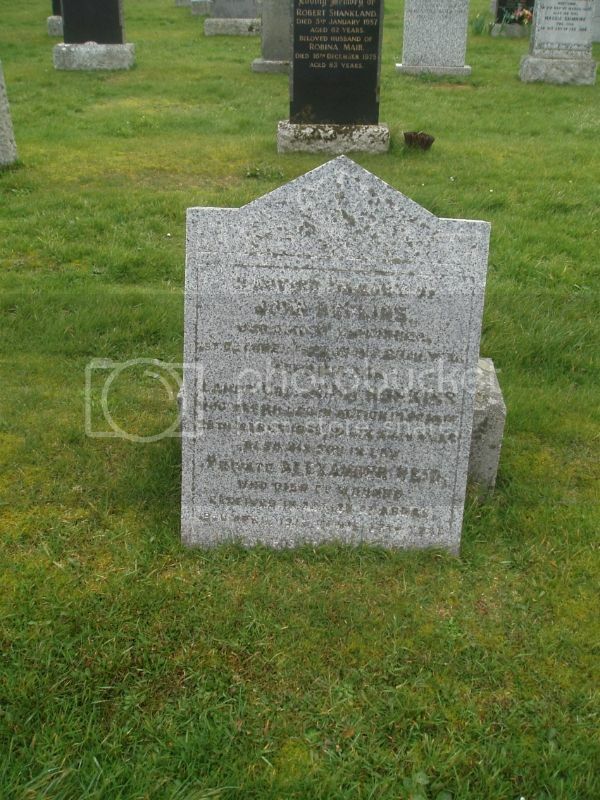 And their daughter Margaret (Peggy) who died in Victoria Infirmary, Glasgow on 15th October 1930 aged 24 years. 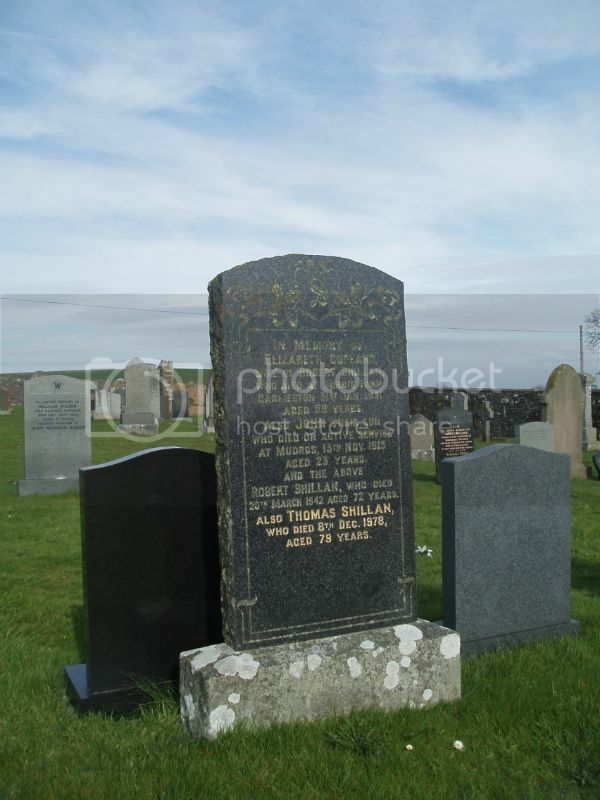 Additional information: Son of Robert and Elizabeth Shillan, of South Balfern, Kirkinner, Wigtownshire. 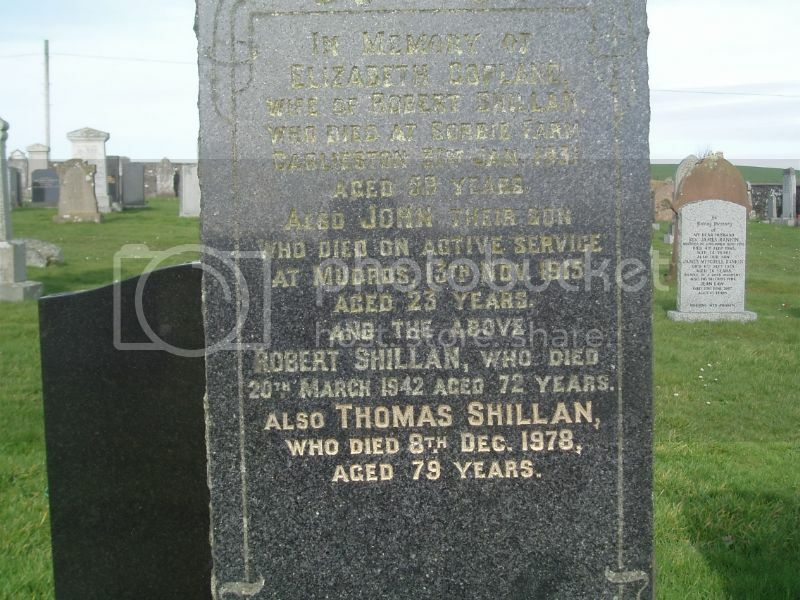 Wigtownshire Free Press (2 December 1915) reported: Mr and Mrs Shillan, Stewarton, Kirkinner, have received intimation that their son, Pte John Shillan, Lanarkshire Yeomanry, has died at No 15 Stationary Hospital, Mudros, from dysentery. 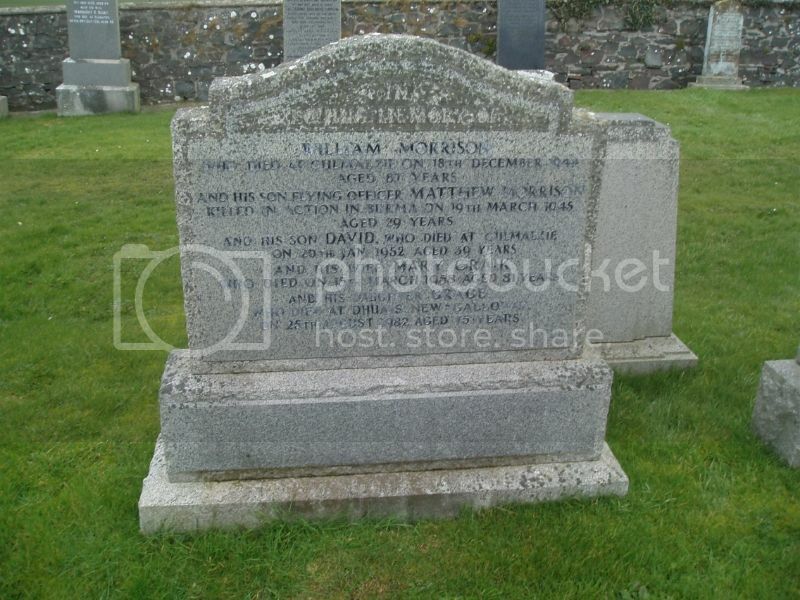 Prior to enlistment he was engaged as a farm servant at Waterside Farm, Dalry, Kirkcudbrightshire. 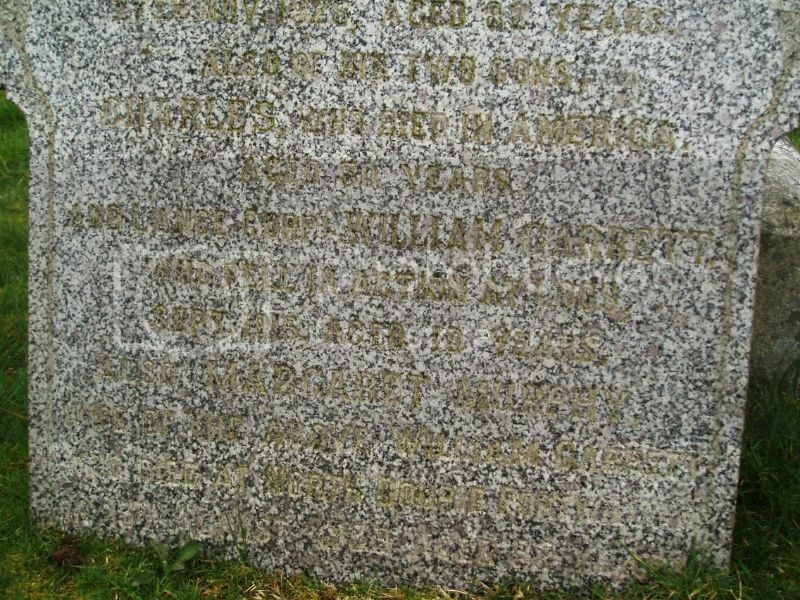 He enlisted early in June, went through training at Aldershot, and went out to the front with his regiment in September. 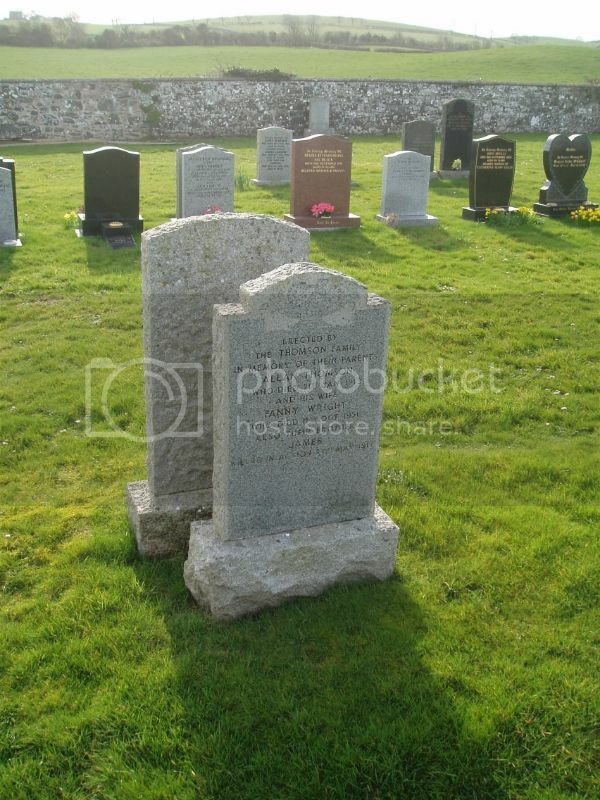 He was 23 years of age. 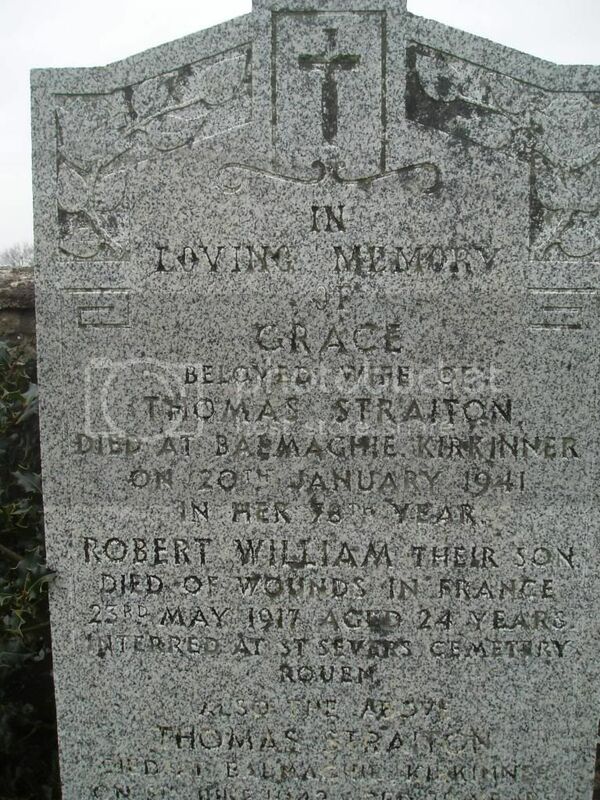 Additional information: Son of Thomas and Grace Straiton, of Kirkinner, Wigtownshire. Native of Garlieston. 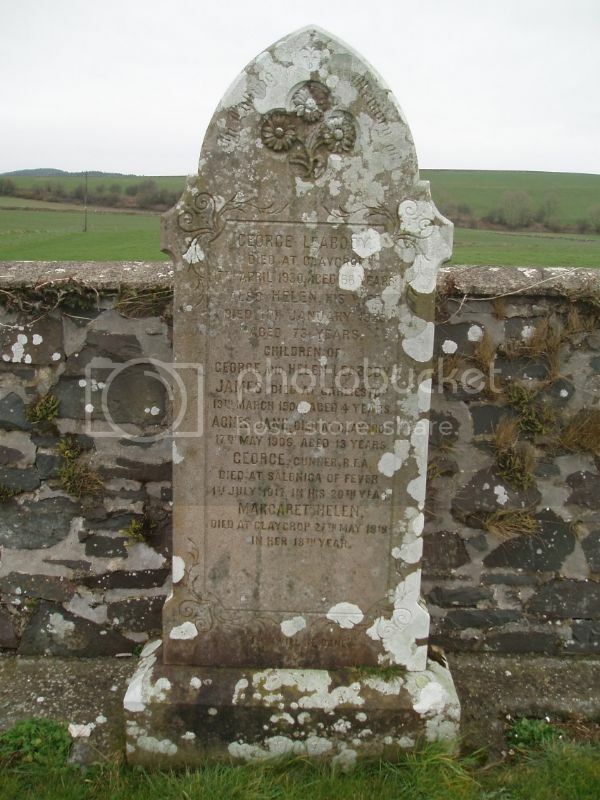 Wigtownshire Free Press (7 June 1917) reported: Mr and Mrs Straiton, Pier Cottage, Garlieston, have been officially informed that their son, Private Robert W Straiton, Scottish Rifles, died in hospital on 23rd May from wounds received on 8th May. Pte Straiton joined the Military Training Association in Edinburgh at the outbreak of war, and was at that time engaged in the office of Dundas and Wilson, estate agents, Edinburgh. 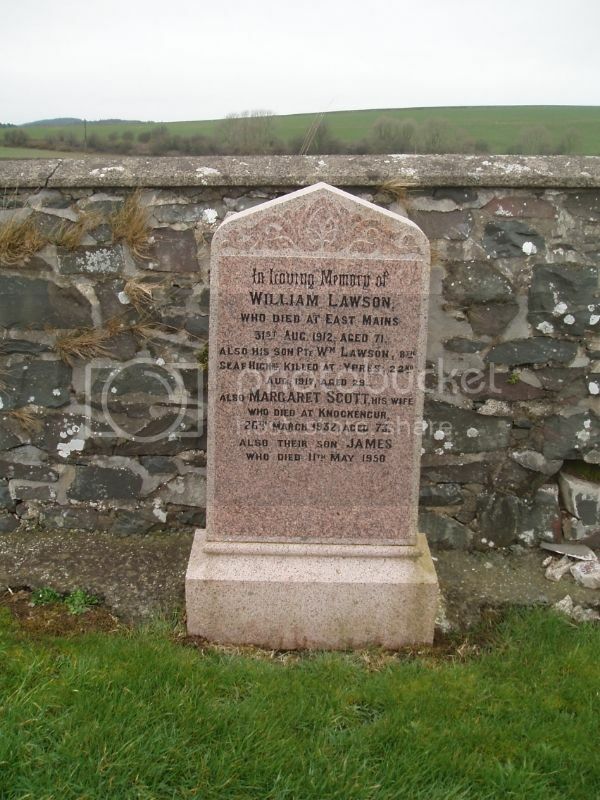 Prior to that he was in the office of Mr McWilliam, law agent, Wigtown. There's an interesting mix of useful and confusing information here for Robert William Straiton. 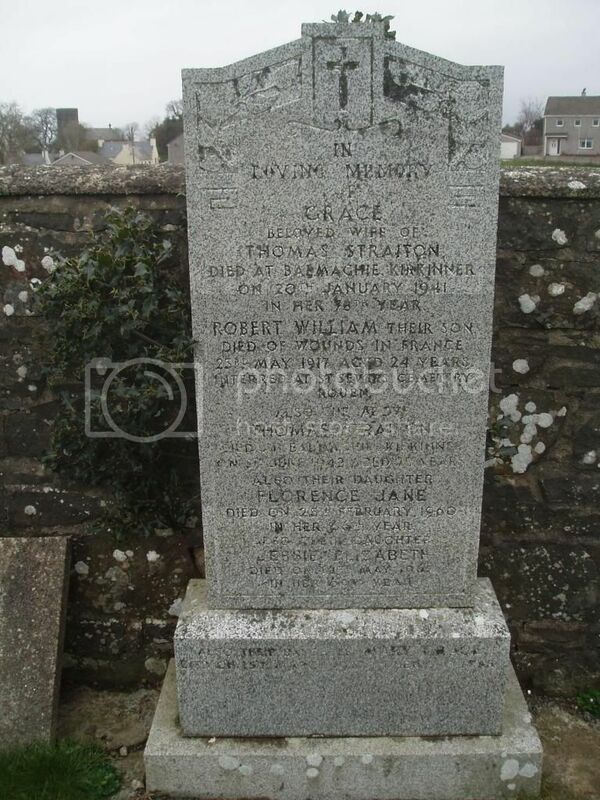 CWGC has "native of Garlieston" and he is named on the Sorbie Parish War Memorial in Garlieston. SNWM has born Garlieston, however SDGW has born Parton, Kirkcudbrightshire. 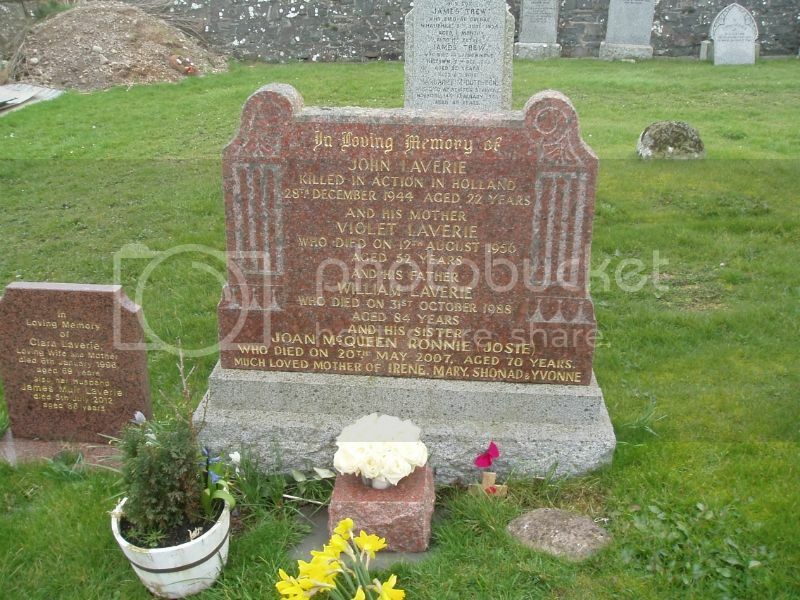 He was in fact born at Laurieston Hall in Balmaghie Parish Kirkcudbrightshire (the other side of Loch Ken from Parton) and "Balmaghie" was the name of the house in Kirkinner where his parents Thomas and Grace died in the 1940's. Previously they lived in Pier Cottage, Garlieston.